What color is that? 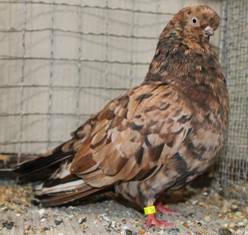 For pigeon breeders who have grown up in pigeon and poultry breeder clubs and are influenced by the exhibition activities, a strange question. You look at the standard and compare. For Almond e.g. you read "an almond-colored ground with black sprinkles or stipples, primaries and tail tricolor". If the deviations from the standard are great, then it is no longer a bad Almond, but an unrecognized color. For some colors, standard experts must also fit. 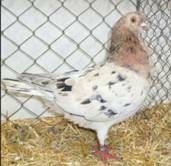 Pigeons with the meanwhile well-diffused gene 'Rubella' are not known by the standard. Platinum is in combination with the Spread factor in the standard, the bar and check variant not. An early statement from the experts was ‘false color’, a 'color deviation, worth for nothing. In the meantime, beyond the exhibition scene, a scene has developed in which there is an interest in rare colors and not least in the "false color-class" to take it with humour. It is worn by former racing pigeon lovers and high flyer and roller enthusiasts, who usually do not know any standards and are only vaguely informed about genetic backgrounds. When asked which color is that, it will be best and most appropriate to answer, a beautiful one. Because it will rarely meet the requirements of the description for any exhibition class. Opal e.g. is an attractive name. Opal as a gemstone is appreciated by the brightly colorful and dazzling color play of precious opal. 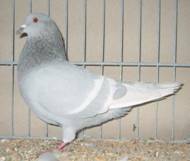 However, there are only three color classes with the genetic factor Dominant Opal in the pigeon standards. And they already existed, before it was known that there was a genetic factor Dominant Opal behind the standardized colors. The trait was analysed and named by W.F. Hollander in 1938. Standard colors are light blue with white bars, light blue white laced and Isabel. The opal colors beyond the exhibitor scene are closer to the brightly colored and dazzling color play of the opals than the standard colors. Often also by being "spiced up" with additional modifying genes. Thus, by adding the factor indigo, that (shall) lead to 'Opalusian'. 'Shall' in parentheses, because the Spread factor also present at Andalusians after the experience in other combinations could rather suppress the color play. 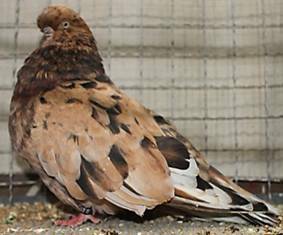 With many genetic factors in the loft, it is no longer possible to control what is involved in a pigeon and what is not. Supplemented by grizzle and the pied trait, the spectrum can lead to 'Opalusian grizzle pieds'. Further extensions are possible. Standard authorities would be overwhelmed, for each variant to form a class or even to find a catchy name for it. At the stipple factor matters are similar. In the standards and at exhibitions there is the stipple factor e.g. at English Short Faced Tumblers. 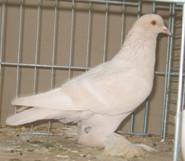 For a while in Germany the breed was called English Almond Tumbler and the complementary colors considered means to an end. 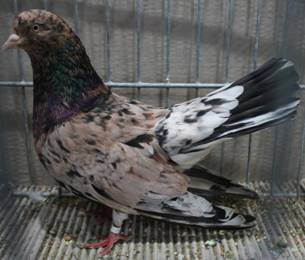 The trait exist at the Modenese Pigeons as Magnani or multi-colored, in Oriental Rollers as multi-colored and in addition as white-black sprinkes, white-blue-sprinkles and silver-black sprinkles. Silver and white black-sprinkles are considered to differ due to modifiers. Often also for the multi-colored class we are not sure whether alleles of St or modifyers are at work. For Danish Tumblers the standard enumerates brown, yellow and gray stipper. This designation of the Danish Tumblers regularly leads to misunderstandings, because they are genetically not brown and not yellow. The name Stipple or Sprinkle does not seem to have a high profile for breeders. 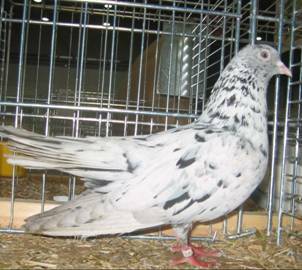 Thus many fanciers declare all pigeons that have the stipple factor as Almonds instead of Stipples. And that also when the almond color is totally missing. Christie and Wriedt, who first genetically tested the stipple factor and reported about their findings in 1925, did not call the factor Almond as some may believe, but sprinkle or stipple with the symbol St. According to their scheme, Almonds like the English short Faced were brown-black sprinkles, and light brown-gray sprinkles as dilutes. In addition, they distinguished stipples with a white ground as white-black sprinkles. Intermediate types, which make up most stippled birds beyond the exhibition scene today, were also known to them. At the illogical naming of the intermediate types, e.g. as black Almonds (either they are black or they are almond-colored), the literature is not innocent. At times, not only the Almond color was famous, but also the term Almond was used for the gene instead of stipple introduced by Christie and Wriedt. 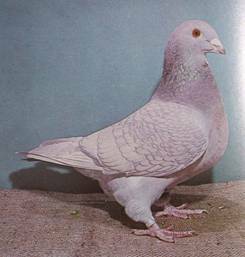 As an excuse and explanation it can be stated that at that time apart from the English Short Faced Tumbler hardly any other breeds with the Stipple gene was well known. Árpád Cséplő from Hungary was probably the first who prophesied to us, and also to the author, that the lax handling of the terms would still hurt us. And he was right. 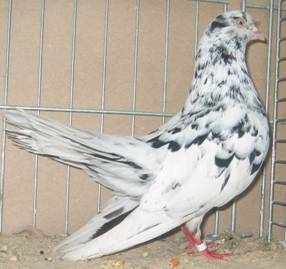 Beginners often have difficulties to understand that a pigeon color is the combinations of many inherited factors at the same time. Not just for the base color and pattern, but for many more. 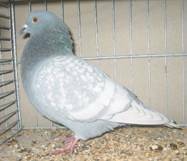 A pigeon can have the factor Dominant Opal and at the same time the stipple factor. In addition, the indigo factor, grizzle etc. Therefore, simultaneous assignments to the group of opal variants and stipple variants are possible. Perhaps the introduction of a more open-minded AOC-class at the shows would be a way also to integrate fanciers that not yet participate. The playful and joyful element perhaps would be back again. Pigeon breeding is finally a hobby. Some breeders have tried to build a bridge between exhibition breeders and others. They have called the Almonds according to the standard description and classical literature (Fulton 1876, Lyell 1881) as 'classic Almonds'. Similar variants would then be simple Almonds. These are something like Almonds 2nd class. One uses the brand, Almond ', without at the same time meeting all quality criteria. This already de facto was done in part in some standards, only that one has called the second variant 'multi-colored'. Names are not insignificant, as not only marketing experts know. From the renaming of the 'Silver King' to mealy brown bar, the color class has never really recovered. 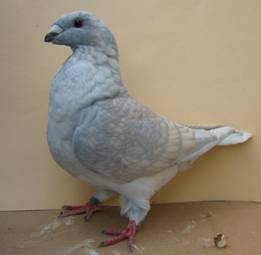 In the Oriental Rollers, for example, the Americans have renamed their former multi-colored to 'Almonds', even though very few pigeons met the standard requirements of the 'classic' Almonds. Perhaps a reflection on the traditional name 'Magnani' used by the Modenese breeds or on an early name as 'Harlequin' could be useful. May be these will find more acceptance.